Raxel is a typical vain wannabe rock star who is the lead vocalist/guitarist of his rock band, Death Crunch. Leaving high school to persue his musical career has caused a permanent rift between Raxel and his municipal assemblyman father. Raxel becomes a Viper and enters the Armstone City tournament to gain fame and promote his rock band. 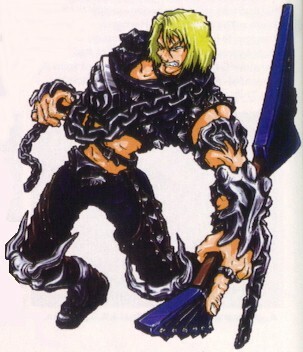 I'no wasn't the first fighting game character to fight with a guitar, this guywas! He was a simple & straight forward design, but really nothing that extraordinary when compared to other fighting game characters at the time. I guess you could say he rounded out the Fighting Vipers cast fairly well and was a decently cool fighting game character... for the 90's.